Hey guys! Welcome to another Friday Feels where I share what I’m feeling this week. This week I’m feeling spring! Or I was until it snowed yesterday, but I’m still pretending it’s spring inside. I’ve gotten a few questions lately about different plants you all have spied in my photos, so I thought I would share a couple shots of them today and some tips about how to care for them (or at least what works for me). I think at this point I’m not quite considering myself a full fledged green thumb, but it’s definitely like lightish green and on it’s way. I mean if you have kept a few plants alive for a few years or so, I think I must be close to getting an invite to the club right? These little trees that I have had on my mantel (my old one too) are ficus trees. I will admit these can be a bit finicky and have been giving me trouble lately. They are getting more direct sun than they like this winter and they also don’t like wet feet. So I typically water these guys only once a week. I just picked up this beauty at Fruitbasket Flowerland (my fave local greenhouse in Grand Rapids) and I can’t for the life of me remember the name of it, but I know it’s a type of fern. I love jade because it’s super easy to take care of and pretty sturdy, which is why I’m hoping he will survive my kids’ pillow fights down here (see the basement kids zone here). I have some in my laundry room too. These are kind of like succulents and don’t like a lot of watering. I got a lot of questions about this plant in the half bath (see the half bath post here), these are real ferns. I bought 2 little ones and planted them in this long planter. We have a nice sized window in here so they like it just fine in this little half bath. 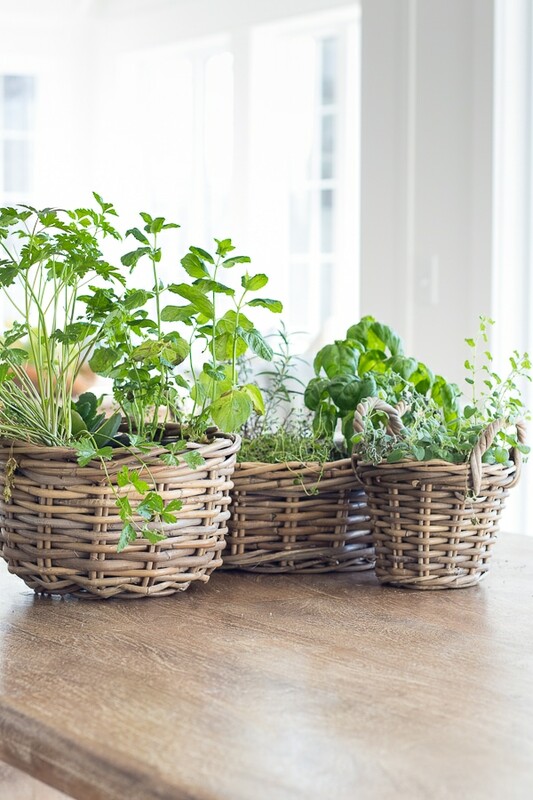 Herbs are some of my favorite plants to use in the kitchen, because they are obviously practical and useful, but also pretty. I just planted these baskets again, so I can pretend like it’s spring soon (see more of our dining room here). I have a little herb overflow in this corner of the kitchen too. Speaking of spring, the lake melted! I can’t even explain how nice it is to see blue water out my windows again! Makes all the brown grass kind of fade to the background. What are some of your fave plants? I am so getting the itch to tackle my flower boxes but here in Michigan we are a ways away from that. You absolutely do the BEST posts of any blogger out there!!! Just want you to know your hard work is truly admired and appreciated!! I’m always inspired!!! Thanks Penny, wow what a compliment! I really appreciate the encouragement thank you! Will you let me know how you transitioned the wood flooring in the master bedroom to the whitewash tile in the bathroom? 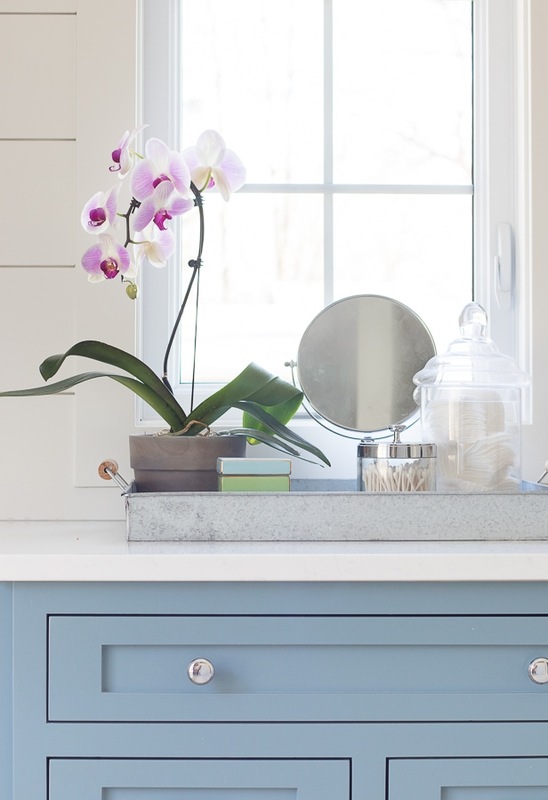 I love your home and your blog, it is so lovely! HI Sharon, I just ran the boards the other way. So they run perpendicular and the ends of the tile just bump into one of the boards running the other way, if that makes sense? Your photos are beautiful. I wonder if you did a post on camera and settings? I take real estate photos and often (due to gray skies) I have to photoshop in the windows. I was wondering what setting you used to bring the lake in but still see your amazing interior as well?? I was going to ask the same thing about your camera settings! Great photo of a great view! I have had enough people ask about camera stuff that I think I’ll do a post about in my next friday feels so stay tuned! Stay tuned I think I’m going to do a Friday Feels about it soon! Beautiful…I also love plants and now I am growing some cactuses I dug up in Fla. I put them outside last year and our Michigan summer did great by them!! Oh wow that’s such a fun idea! Can’t wait to see your window boxes. They are what first attracted me to your blog in your other house. I think of them as your signature item. They invite us into your beautiful home. I’m excited to get started on them too, a few more months but I’m already planning! Thanks Lynne. I look forward to opening all of your posts. 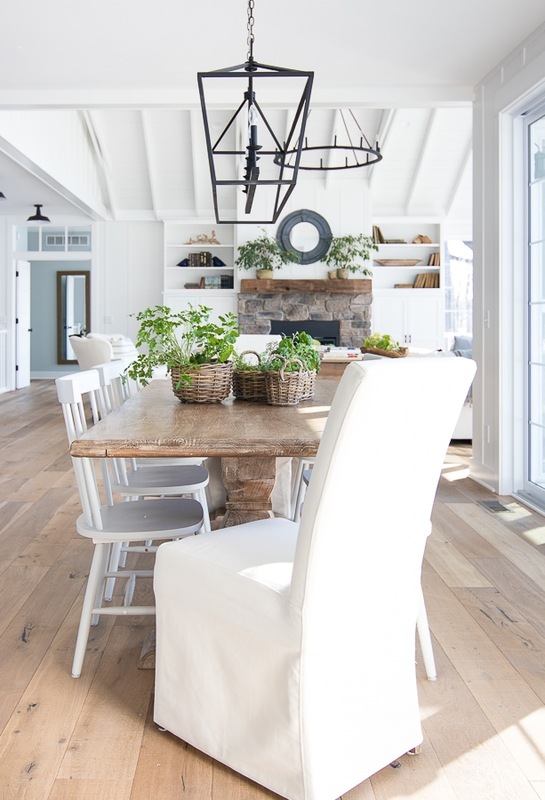 Your home is a beautiful inspiration and I can’t get over how quickly you put it all together! Just beautiful…as always. All of your plants must love the natural light. I seem to thrive more too the more I’m exposed to natural light! ;) Your blog posts are always so inspiring! I too find my passion in decorating. I would love to do what you do…someday. Yes we do get a ton of natural light in this house and I’m with you I need as much sunshine as I can get especially during Michigan winters. Your comment totally made my day, truly I had a frustrating week and I really appreciate you taking the time to be so encouraging. Love this! 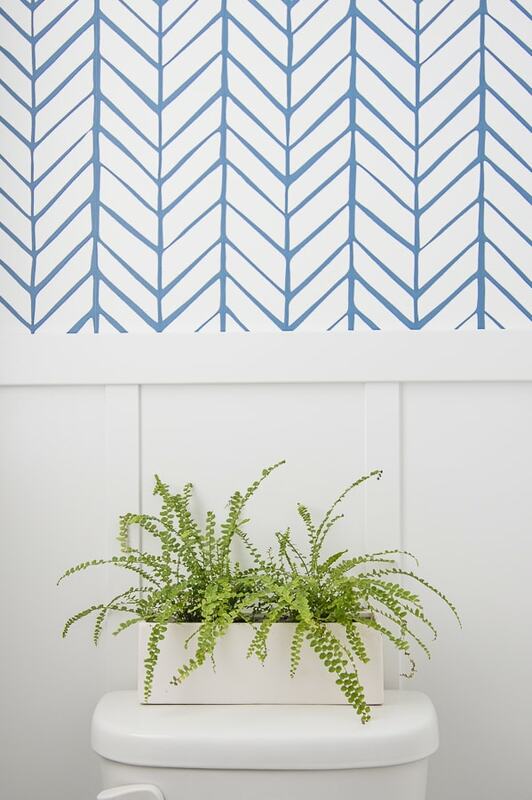 Those ferns look adorable in the bathroom. And that view of the now-blue lake and sun shining in … spring is in its way! Thanks Emily, let’s cross our fingers spring shows up soon – supposed to snow tonight ugh! My mom had two green thumbs but apparently that gene skipped a generation. :-( I swear that last time I put a plant into my shopping cart at the nursery it jumped back out to the shelf! I’m going to TRY some herbs this year and hope for the best. On the other hand, that incredible blue water view from your living room has me mesmerized. I would never get anything done with a view like that! Thanks for sharing your lovely home with us. I really look forward to your posts. Oh my gosh. The lake through the windows…. sigh. What a dream. So truly gorgeous. Trying so hard not to have backyard envy lol. Ours is wild with woods at the back, which we love, but THE LAKE. That is where my heart is being a Michigan girl too! Your home is breathtaking. Thanks so much Jessica, we do love it here but looking out on the woods is pretty fantastic as well I bet! 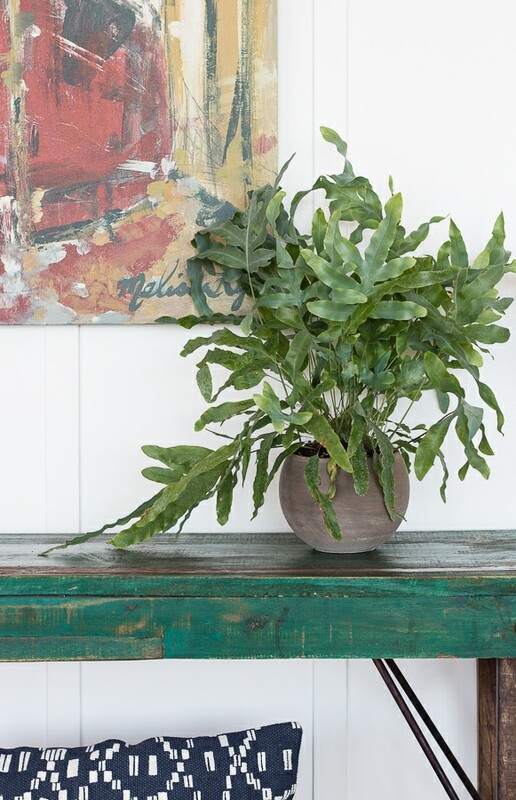 The plants look beautiful and perfectly placed in your home! An awesome job as usual! Love your home and decor! 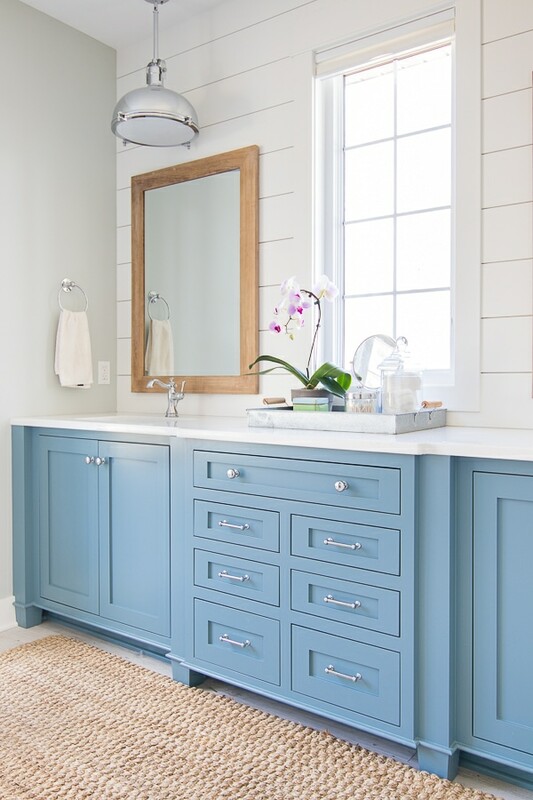 I love the rug in front of your bathroom vanity. Do you by chance remember where you purchased it from and what are the dimensions? It’s from World Market, I think its 8 ft long – thanks! Plants have been on my mind this week…so this is a perfect post. 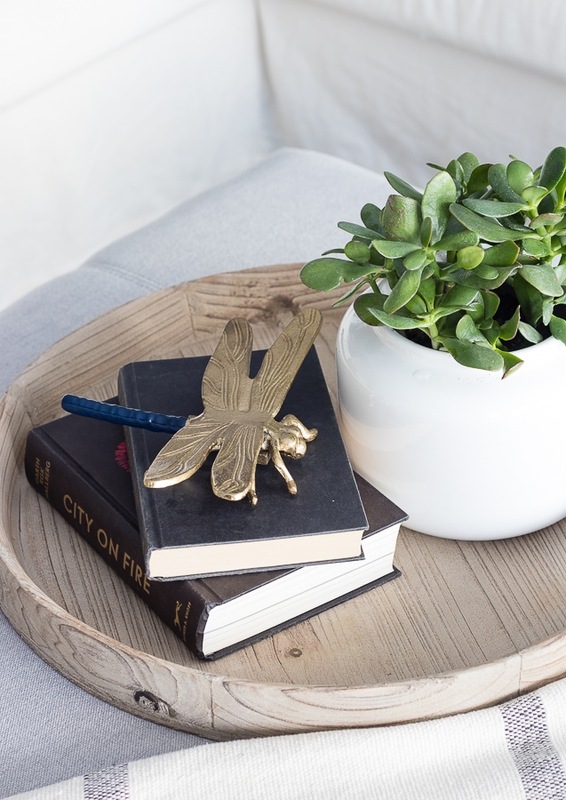 What is the plant on your coffee table? I think I will purchase a jade plant. It seems like that MIGHT be one I could keep alive! I am also on the search for fake plants that I can pass off as real ones. That view!!! GF, I would be living in that room 24/7! I know that you know how blessed you are!!!! That is a good question! I’ve had that one for 5 years I think it’s just a type of ivy? Love this post! Plants really bring life to a home. It is such a pleasure to tour your beautiful home. Thank you for sharing with lovely photos. Please tell me the source of your dining table. Does it ave two pedestals? Thanks! HI Linda our table is from Art Van which is a local midwest chain, if you don’t have one near you I do have a similar one linked in the shop our home page -thanks! 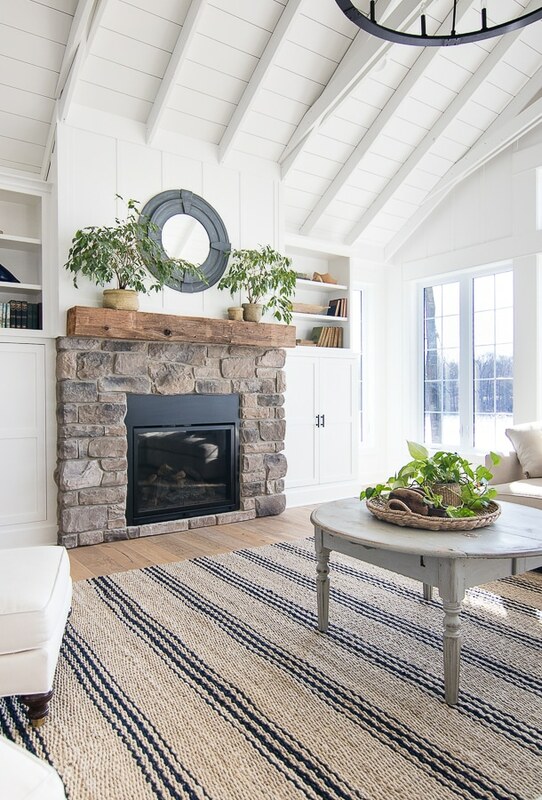 We like the fireplace and would like to replicate it in a renovation we are doing. Do you know where the stone came from? Is it faux stone? If so, where did it come from? It’s from J&N stone in the style Quartz the color is Price – thanks!